Styling your coffee table is one of the funnest and quickest ways to change the look of your living room. But for many, styling a coffee table can be a daunting task. For those of you who find yourselves a bit "challenged" with creating an interesting and balanced vignette on your coffee table, I bring you a new blog series called "Styling A Coffee Table" where you can find tips, tricks and ideas for styling coffee tables and a few other seasonal things here and there! My blogger friends and I got together to share what is currently on our coffee table each month (kind of like a blog home tour). You get to see many different ideas and tips on getting that vignette looking just right! At the end of each monthly post for this series, you will see links to all the participating blogs. Cool, huh?! And if you are coming from my friend Laila's blog, I welcome you! This month, I am sharing a Halloween coffee table that I created by re-using item that I already owned. ZERO DOLLARS SPENT! I wanted to create something that felt dark and mysterious... using my favorite color: emerald green. The focal point of my vignette is the largest piece, my brass urn. 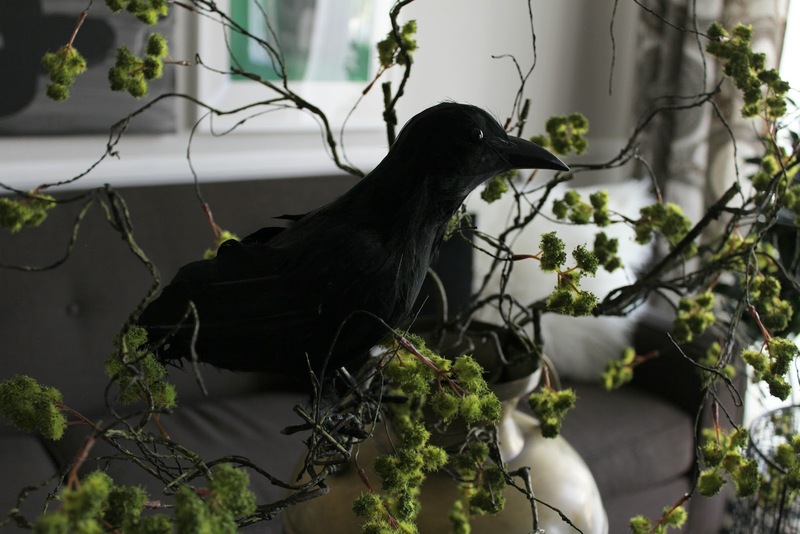 I added faux stems to my urn and perched a black crow on one of the branches. The urn is where I started and built from there. The next biggest piece was the black birdcage to the left that is housing my owl friend. 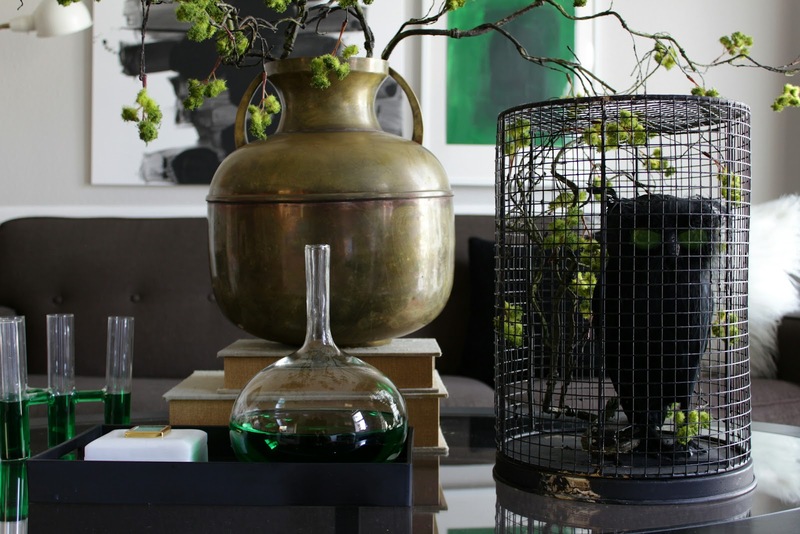 My "birdcage" is actually a trashcan turned upside down. I then filled the negative space on my coffee table with my glass "vials of magic potion." This "magic potion" is just water and green food coloring. 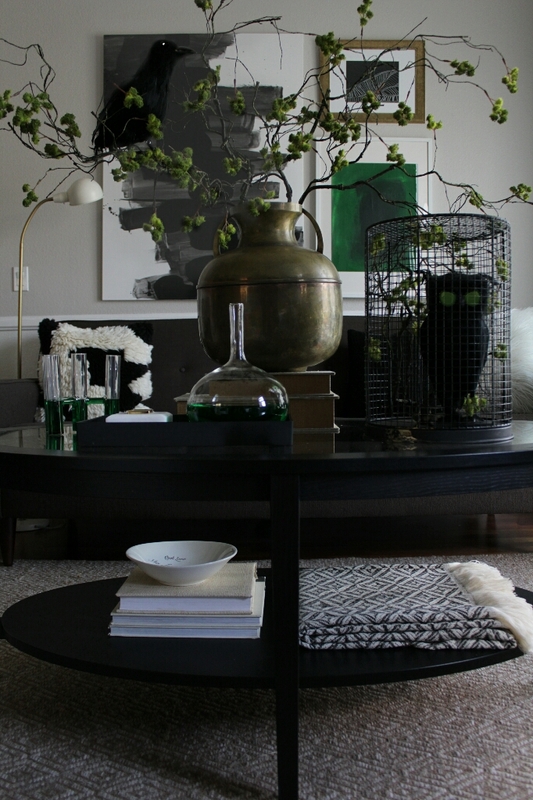 Let's dissect this coffee table arrangement to understand what my eyes see when creating a vignette. I created a balanced composition. I start with my biggest item as my main focal point. I then added two more key items (one medium size and one small size) to balance out my arrangement. I create a sort of "pyramid" shape with my items. The tallest one in the middle, and the medium and small size on either end of the tall item. Then I add just one more smaller item casually placed besides my "pyramid". This gives my whole vignette more fluidity. In this case, it was the test tube vase to the left. And there you have it! A creepy, but cool Halloween coffee table! The magic potion strikes again! Your creativity and brilliant styling ideas are striking! wow! thanks Amie! Means a lot coming from you! Oscar! I adore this whole vignette! I love that it's creepy, elegant, and chic all at the same time. And I love the mix of green and black - stunning! I love this! Curious what you used for the base of your bird cage/upside-down trash can? this is such a genius idea! Oscar!! This is magnificent and I love that green! Your main centerpiece it's just fabulous and I always love that urn. And super cool magic potion LOL! Well-done my friend! Thanks Summer! That urn is a favorite of mine! Oscar, I'm obsessed!! I love your color palette and how you've done Halloween in such an elegant chic yet spooky way! And that "potion" , genius!! Bravo, Bravo! You are so creative and I loved your post! Ok, I must admit that I loved your upside down trash can! Magnificent idea! Now, I want to decorate for Halloween. But, my family is like, What is going on with this tree branch on our coffee table?" Looks like you have a big decor item too! Oh well, life with a blogger, I say! You created dark and mysterious in such an elegant way. Thank you for sharing your thought process... there's so much to take from it! ���� Well done! Oscar I love this...WOW!!! The design is brilliant. Especially the color, texture , and composition of the style. Perfection!!! My Week - Impromptu Birthday Brunch!